On Jan. 15, video streaming service Netflix made headlines as it increased its subscription price by 13-18% across the US and Latin America. This is the biggest increase by the company since its inception 12 years ago and will impact 58 million American subscribers, who will now have to shell out at least $13 for a month of streaming. India, which has become an important market for Netflix, escaped this price revision. Probably because the service is already too expensive here. 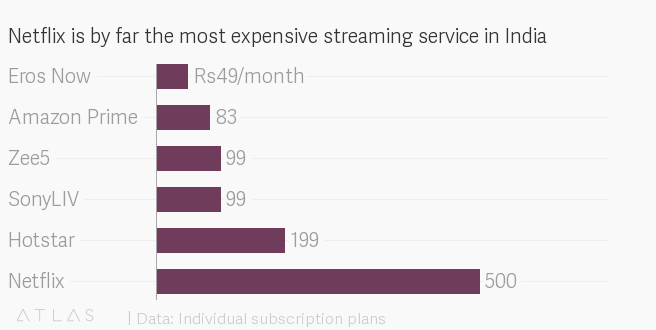 Netflix’s basic monthly plan in India starts at Rs500 ($7). In comparison, homegrown over-the-top (OTT) platform Hotstar—the next most expensive video streaming service—is priced at less than half that. “With homegrown names (Star India’s Hotstar, Viacom18’s Voot, Zee’s ZEE5, Balaji Telefilms’ ALT Balaji, and Sony’s SonyLiv) and independent platforms like Spuul and TVFPlay giving tough competition to both Netflix and Amazon Prime Video, Netflix cannot afford to take prices any further north from where they are currently,” said Sanchit Vir Gogia, CEO and chief analyst at Greyhound Research. Meanwhile, some experts believe Netflix isn’t interested in getting into price wars at all. It’s playing a whole different game. Also, Rs500 per month may be a less competitive rate when compared to other streaming platforms, but it’s still less than the price of two tickets at a multiplex, Harish HV pointed out. Moreover, it would be an “over-generalisation and simplification” to call all Indians price-sensitive, said Yugal Joshi, vice-president at Texas-based consulting firm Everest Group. However, Indian users are not getting real bang for their buck. For instance, despite paying nearly the same as Canadians, Netflix’s catalogue in Canada has 3,991 movies versus 3,690 in India. Additionally, the platform barely has any regional-language content in a country where only around 10% of the population speaks English. It runs the danger of being “perceived as lift-and-shift of Western markets,” said Joshi. “There is surely scope for Netflix to improve its roster of offerings and that is the reason of licensing with movie studios and other content creators,” he added. In 2016, Netflix inked a deal with popular actor Shah Rukh Khan and his firm Red Chillies Entertainment. More recently, it has been trying to up its game by producing more original content in India, for which it has earmarked almost Rs600 crore.